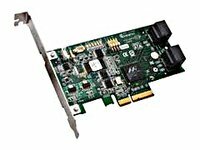 Adaptec - 2240900-R ADAPTEC - 1430SA KIT 3GB 4CHANNEL PCI EXPRESS X4 SATA II LOW PROFILE RAID CONTROLLER CARD (2240900-R). NEW BULK. IN STOCK. SHIP SAME DAY.